Customers like simplecall because of the state of the art features of our international calling service. We try to constantly innovate to make sure that we are addressing our customer needs and therefore ensure that we introduce innovative features so that they keep benefitting from all that simplecall has to offer. Calling South Africa with simplecall will only cost you as little as 35.76¢ /min to landline and mobile phones. Many providers may claim to be cheaper but you actually end up paying more because of the hidden charges and fees. With simplecall you only pay what you use and that’s it! simplecall is a PINless, hassle-free international calling service that fits in perfectly with your demanding lifestyle. 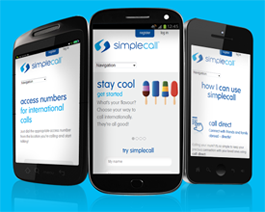 You can register with us by visiting www.simplecall.com and see how convenient it really is. You get a range of services once you join simplecall - a really cheap international calling rate, itemised billing, the ability to top up online and lots of other features that are sure to make your life easier. You can also store your favorite numbers so you can call them with the push of a single button. And you can do all this from a mobile phone, landline or even your PC. A large South African contingent has made the US its home. South Africa is rich in precious minerals like gold, diamond and platinum. Rugby and cricket are the two most popular sports in South Africa, closely followed by football. The country hosted the World Cup final in 2010. Who can ever forget the vuvuzela!